This recipe can be varied with the use of white wine instead of red, or by adding anchovies, olives or bacon. 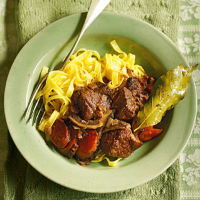 Serve with tagliatelle, tossed in butter. Put the meat in a large bowl with the carrots, onions and garlic. Tie the herbs together with string and push into the meat. Add the peel, black pepper, brandy, wine and 4 tbsp oil. Cover with clingfilm and refrigerate for at least 24 hours. Preheat the oven to 140C/gas 1. Heat 1 tbsp oil in a large frying pan and brown the pancetta. Transfer to a casserole dish. Remove the meat from the marinade and dry it with kitchen paper. Brown it in the pan, in batches if necessary, then transfer it to the casserole. Take the veg out of the bowl and fry in the pan until lightly browned. Add to the casserole with the herb bundle, strip of peel, tomato purée and chilli, crumbled. Pour the wine marinade and stock into the frying pan, bring to a simmer, then pour over the casserole contents. Cover; put in the bottom of the oven for at least 3 hours, until the meat is really tender. Check that it is not drying out; add a little more wine if necessary. Wipe the mushrooms, slice them and cook in a frying pan with 1 tbsp oil until lightly browned. Add to the casserole, and cook for 10 minutes more. Remove the herbs and strip of orange peel.